Some post ago we presented a PCB to mount the SIM900 module. The project is used in our GSM remote control and the Arduino GSM Shield. The dimensions aren’t big (1.75×1.95 inches) but in some cases they are too important for a projects, so…. ..we have developed a small PCB GSM module to build device like localizators (coming soon… :-) ), bugs or other small devices. The schematic is the same of the old module. The printed circuit board, measuring about 1.35×1.5 inches, has a pin strips (10 pin x 2) used to connect with the circuit board of the remote control device. Let’s now take a look at the electrical scheme, which displays the connections. The pin 1 (ON/OFF) is used by a microcontroller to turn the GSM module on and off. The module is turned on or off according to the logical level applied to their PWR line (pin 1 of GSM1) . The PWR line is equipped with an internal pull-up resistance and is active at logical zero; therefore, in order to switch the cellular module on, the microcontroller sets PWR at a high logical level (contact 1 of the pin-strip) and causes transistor T2 to saturate; this transistor will then sets the PWR line at a low level. Remember that the power on or off signal is only a pulse of about 2 seconds. Reset monitoring is handled similarly. The module can be reset by simply causing the microcontroller to send a logical 1 via the RST line, at which time the T3 transistor saturates and sets the NRESET line of GSM1 at a low level. Let’s now proceed with UART’s control lines (i.e., TXD, RXD, DTR, RTS, CTS, DCD), which are connected to the external area through the pin-strip’s contacts, respectively, 12, 14, 10, 2, 4 and 6. The audio device, with two contacts for the microphone (with differential input) and two more for the loudspeaker, uses contacts 15, 13, 11, 9, which correspond, respectively, to MIC1P and MIC1N (positive and negative of the microphone) and SPK1P and SPK1N (respectively, positive and negative of the loudspeaker). The RI signal (indicating incoming calls) goes out through contact 8 of the pin-strip. 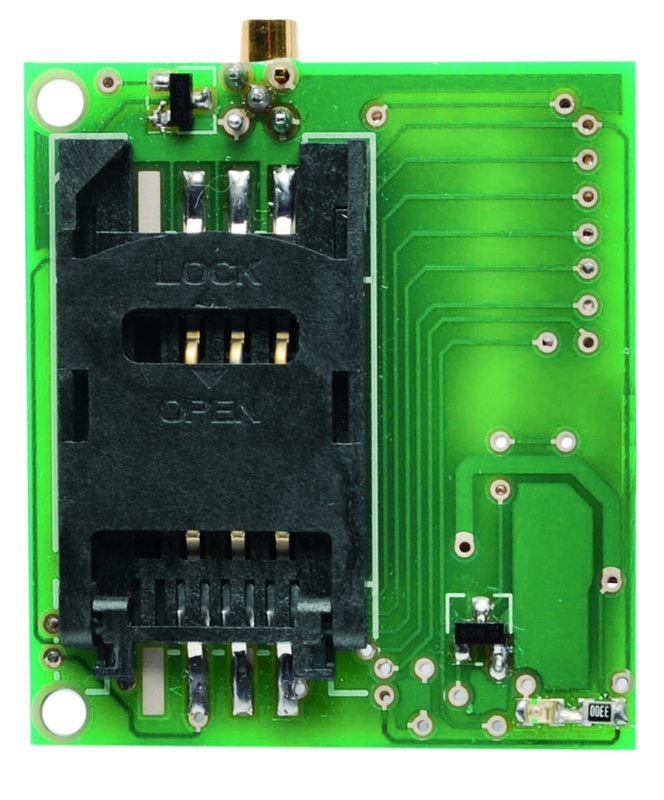 In this case, the GSM connector modules’ antenna is a 90° MMCX directly connected on the printed board of the cell phone. Let’s now talk about transistor T1, used here to locally control the cell phone’s reception LED: its base is polarized from the current logical level on pin 52 (NETLIGHT) for GSM1. The transistor’s collector is where the line to contact 3 of the pin-strip starts; this line is connected with the LED line, which the microcontroller uses to get information regarding the presence of GSM network as well as regarding the connection status of the module (e.g., whether the network is available or not). This breakout board looks great! Have anybody tried it (or SIM900 GSM shield board) in USA with AT&T? Can I replace SIM900 with SIM900A in the above schematic? Will it work? is this gerber file works with sim900A? Someone has bought the other GSM breakout http://www.open-electronics.org/products-page/gsm-breakout/breakout-sim900-gsm-module/ also in USA. Nobody said me that found problems. Keep in mind that I am an amateur and so any differences are a big deal for me to understand. 1). For the power switch you use two resistors (r9,r8), which you set to (4.7k,10k) and the application note puts them at (4.7k,47k). Is this simply because you need less voltage at your base due to transistor choice? 2). Also between the simcom900 chip and the sim card you put 15 ohm resistors instead of the listed 22 ohms (not a big difference, just curious). 3). In the same connection you use a 220nf (c1) and 10kohm resistor (r4), whereas they have a different setup (not bridging data and vdd with a resistor (r4)) and they use 22pf and 100nf in their designs. 4). I notice that you use a similar design in the application note for the power supply, in that you use 2 capacitors in parallel to ground, but they suggest 100 uF and 0.1 to 1 uF in parallel. I am looking to connect an arduino mini for now to this module (3.3V) presumably that should work by just connecting the vcc,gnd, rx, and tx, and ri connected to a data pin or something, no? Many choiches are made for availability, no more. To control the module you must use also power pin. You must give to this pin an high pulse (the transistor inverts this pulse) to power on the module. Thank you for your quick response. I meant, can I use the 3.3v from arduino pro mini to power the device (with the board you have)? Or will it draw too much current? If it does use too much current, can I add something to help allow for more “Amps” like bigger capacitors? The SIM900 needs 3.2 ÷ 4.8 V. If you use a lithium there aren’t problem. The GSM requires a lot current when attach the net. Hi Boris. Thank you for this great post. I want to use GSM Module to send SMS only. Nothing more. And i am designing my own board based on yours. It is going to be controlled by a low power MCU and i dont want to use pin strips. I just want to connect SIM900 directly to the MCU. Here is what i want to know; what should i do with the pins that i will not use -like mic, headphones etc? Do you have any suggestions about grounding, PCB and connecting the module to MCU directly? TX, RX, ON/OFF, RESET and power pin. No more. The other pins can be left unconnected. Accourding to my R&D 3.3 supply is not working fonr from ardu…. I have tried many times…not working..let me know if this works from your end. I am looking to replace pic with atmega320 with 3.3 volt. We need the .PCB file of this circuit for ProtelDXP. Can you send it to our email please? The GSM module can be used with 3,3V but the 3,3V from Arduino hasn’t enough current. You have to use an external power. I’m sorry but I haven’t the Protel file. Is it possible for you to share the schematics file? .sch? Hi, I’m sorry but I don’t use Eagle to edit schematics files. Sorry for a noob question but which is pin 1 on the 20pin connector? Can not we connect RST and PWR pins directly to PIC? Do we need BC817’s? The application notes suggest a button to be connected to these pins. Council to use pins with open collector outputs (such as RA4). I connected DTR pin and RI pin to microcontroller and then sim900 rx tx stopped communicating with microcontroller. I was making DTR high and low to make sim900 sleep and wakeup. Is something damaged inside sim900? Hi, you have to connect also the ON/OFF, TXD, RXD, RST pins. Check alse the At+CFUN command to know the state of the SIM900. Can this be used to monitor GSM frequencies ? Like being idle and looking at what is passing through the air ? Can someone help me out with the BOM for D1? nut we don’t mount it. Thank you so much for this.I would like to use this design for my Kickstarter project.My project will be open source. good news, if can I help you contact me. SIR! i am trying to use sim-900 in ,my final year project with PLC dear sir kindly refer me to how to use and configure it? can i use this module with arduino without shield. im hope user this module only for GSM & GPRS DATA like sms or internet but no use de audio socket or lcd, then i wish a compac design. Hi, yoes of course but you have to adapt the signal lever. See the shield schematics to understand how connect it. I would like to connect this gprs-module to lpc1768, this is an arm-processor. So I would have to write C/C++ files, Im currently using mbed.org but this library doesnt include gsm/gprs-files. thanks if you can help me out..
ps: somebody told Im supposed to use sockets, is this true or false? hy does this circuit can I use to control the relay by microcontrol atmega 8535? hy apakah rangkaian ini bisa dipergunakan untuk mengontrol relay lewat microcontrol atmega 8535? hy does this circuit can be used to control the relay by microcontrol atmega 8535? Pingback: Bringing the Zach Morris phone into the 21st century | Daily IT News on it news..it news.. I was just wondering about the circuit part that controls the on/off and reset pins. In the breakout, these are directly to the collectors of the transistors T2 and T3. In the SIM900 hardware design document (V1.01, page 23) however, there is a 1k current-limiting resistor between the collector and the pins. The document also mentions that the maximum current that can be drained is 0.3mA. Shouldn’t your design be updated with these resistors? Or did you never had any trouble with it? we use a transistor, you can also use a switch. So no problem. it Works without problem..
Is possible to buy completed module? If yes, what is price? Hi friends..we are the SIM900 completed mould distributor in HK and China. Our MOQ is 1000pcs,update price is $10.5/pc ,anyone interested,please contact me by mail info@lyinternation.com and by Skype” sunnyleeyang”,hope to be partners to discuss the application of SIMcom mould..
We use a special forniture, with DTMF decoder software, antijammer and cell locator. Hi the diodes aren’t mounter in our breakout. They aren’t necessary. demo code for arduino or a library ??? What ttl level converter should I order to be able to use this module with 3.3v or 5v arduino? Sorry for the possibly stupid question. 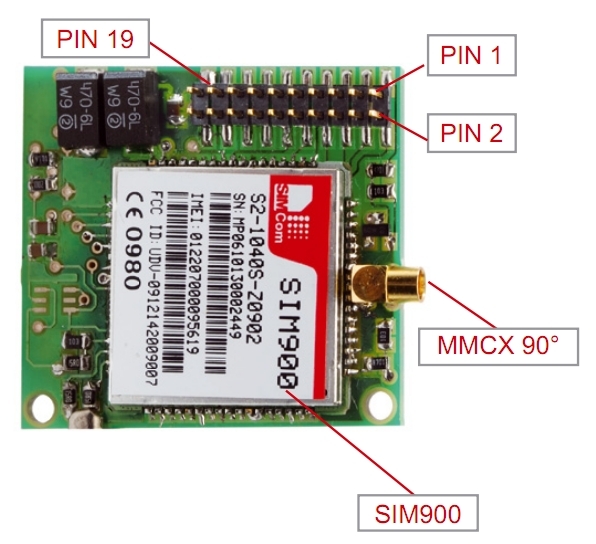 Does this SIM900 GSM Module work in the USA and if so, what carriers? I very interested in this for an embedded product being designed for the USA, but I don’t yet know all the acronyms or much about cellular technology. I believe SIM900 is quadband, hence suited for US. hey… i am working on eagle software for designing the same schemetic……….can anyone suggest me the the link of eagle library in which i can find the SIM900A module for designing the schemetic as i am not finiding it with my version…..
Hi, we don’t use Eagle, so I haven’t the library. i need 900d ckt, does anyone has it?? The new GSM shield has also pins for flow control. yes i know…. but will it work with the GSM lib that is build in to Arduino IDE 1.0.5 ? What is the voltage input for this board ? Is it possible to supply it with the +5v or +3.3v of a Arduino Board ? Hi, I’m trying to use the module, I’ve got pin 1 (on/off) and pins 12 and 14 (softwareserial tx and rx) connected to my arduino, pins 20 and 18 to ground and pins 19 and 17 to an adaptor that can handle 2.5A at 4.5V as the module needs between 3.2V and 4.8 V. Do I need any other pins to send an sms? Can I just apply power and load the GSM_GPRSLibrary_SMS.ino example from MarcoMartines’s repo on github? Thanks! Hi, as far I I know Sim900 is able to drive its own inputs and outputs and also has it´s own ADC, this is possible only if firmware is modified. I got this information from SIM900_Hardware Design_V2.04 documentation.This could be great in order to avoid using a microcontroller. Have anybody done this or known about this? Regards and great job Boris! 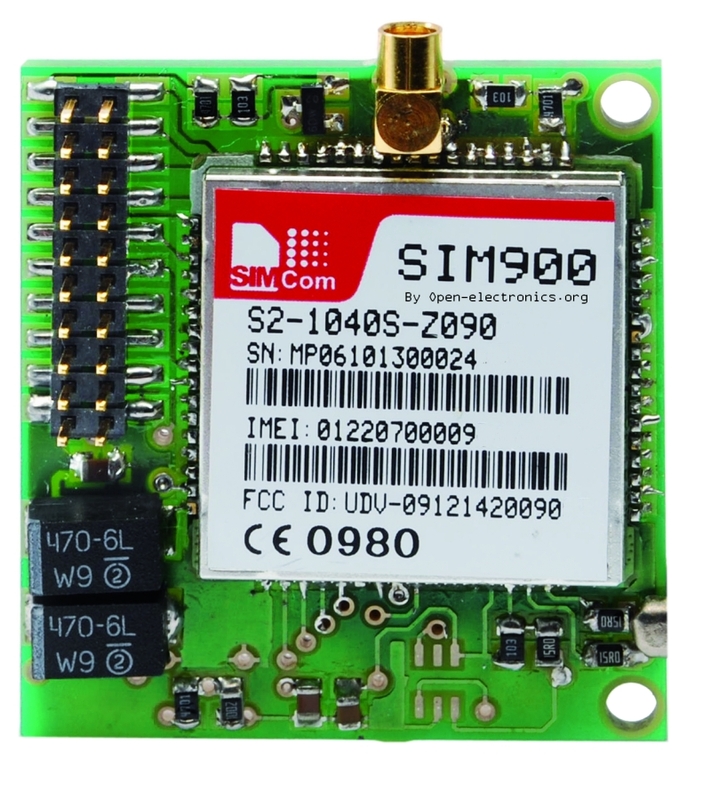 Our SIM900 use a special firmware to use the DTMF function. Our breakout is very small so not all pin are on output connector so we don’t use IO pins. Thank you for sharing that info Patricio – I am looking for similar thing – did you happen to find how to avoid the MCU and take advantage of SIM controlling its own outputs directly? – Please share any pointers you may have come across on those lines. Thx in adv. I would like to make a little changes because I need more pins, could you send me the drawing ? Hii., Thanks for info. could you please clarify my doubt. i’ve the SIM900A core and other supporting components. after designing the PCB., can i directly use this module with AT commands ., or does it require any other firmware.? please provide this info. You can directly manage the SIM900A. In mu sim900 module i can see that RF_IN pin is short-circuited with ground. Is RF_IN to ground connection is expected or i got faulty sample. One more question how can we get 50Ohm impedance at antenna?? is there any free software or manual technic . What are the steps to check that antenna is properly connected to GSm or not and how perfectly is it working. and for AT+COPS i can see only one or two network found. Why does it not finding all the networks? The antenna isn’t connetcted to ground. The signal is good. Have you try another SIM card? The power supply? Hi Boris thanks for reply. antenna is connected to ground!. I have one more question : can i use the same characteristic as your design to get 50Ohm impedance for antenna trace? can i use the same characteristic as your design to get 50Ohm impedance for antenna trace? I tried but i am not able to get 50Ohm impedance in RF trace. I don’t understand you problem. Are you using this board? If yes you don’t have any problem. Hi, all modules are tested. Check the power supply. If you can provide .brd and .sch files, I’ll appreciate. I wanna use some other interfaces of the GSM module(such as I2C etc.). Please help me on this. hi, if i power this board at 3.9 volts does it work with pic MCU powered at 5 volts or do i need a level shifter? . if i need a level shifter wich to use to get 115200 boudrate . thanks. thanks boris , for your answer . Can I also power the board with 4.3V ,using a diode after 5V power supply? Can I connect directly SIM900’s serial lines to a 3.3v logic level device? Do I need a level shifter? Or a voltage divider is enough? By the way I’m interfacing this breakout with MSP430. Thank you for sharing the info, ahmetalncak. It is helpful. So, the pins 12, 14 (TXD and RXD) on this board can work directly with MCUs like ATMEGA etc. from freeduino, right? why we connect 4 parellel capacitors for battery connection for sim900. Can we connect 1 capactor? thanks for your reply,i have read the datasheet for sim900,in that they mentioned 2 capacitors only for battery connection,is it enough or 4 capaciotors are required?and if required can u please tell me the functioning of remaining 2 capacitors. 4 Frequency GPRS/GSM Module-EFCom Pro is an ultra compact and reliable wireless module. I tried the above schematics,its not working,I am not getting power at sim vdd.Can anyone help me out,even I have used D1(SMF05C)but not working. Can I use this without an MCU- I just need a simple control of LEDs- input=output? And how can I make the same so that I use a range of input 3-12V and output is same as my input? Hi, is it compatible with arduino? is it is possible, can you help me related with code?